The four-eyed Mercedes E-class is dead. Ushered in with this facelifted-for-2013 version of the executive express stalwart are refreshed looks, better engines and new safety systems. 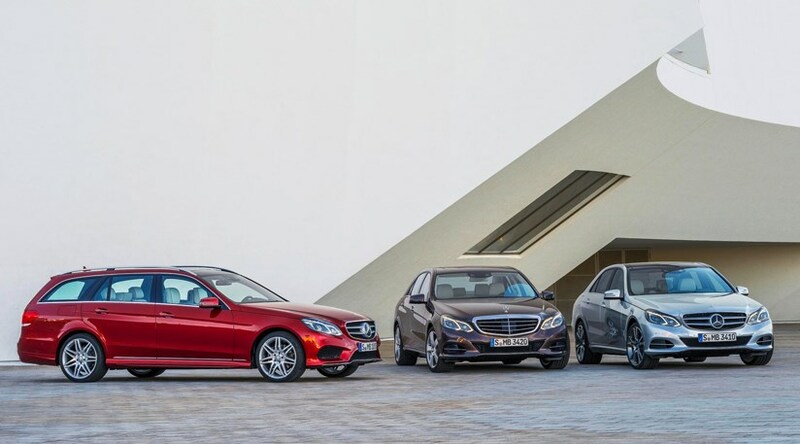 Like the C-class, sportier models get a large grille-mouted three-pointed star: standard E-class models come with the classic bonnet-mounted mascot instead. The bumpers, bonnet and rear lights have had a spot-the-difference nip and tuck, and the heavy-handed rear-arch surfacing has been binned in favour of more sweeping flank lines. The styling is expected to preview the lines of the new 2013 S-class; we also saw clues on the Aesthetics S sculpture Mercedes used to tease the looks of their upcoming flagship. What about under the E-class's new bonnet? As before, there's a range of petrol, diesel and hybrid powertrains. Both petrol engines are now direct-injection 2.0-litre four-pots, with 187 or 214bhp. The petrols score an identical 48.7mpg and 135g/km of C02, but the brawnier motor hits 62mph half a second faster, at 7.4sec. Of course, diesel E-classes will be the big European sellers, and you can spec one of three four-cylinders, or choose the BMW 535d-rivalling 256bhp/457lb ft E350 V6. The standard transmission on the lower-powered models is a six-speed manual, but pricier E-class-kind get Merc's 7G-Tronic automatic 'box. And there are S-class gadgets galore in the new Mercedes E-class too? Yep - the E-class has stolen a march on its bigger brother. The new E comes with collision prevention radar-based warning and drowsiness sensors as standard. An improved front-facing camera scans the road for vehicle and pedestrian obstacles, using two ‘eyes’ looking 50m ahead. Four different suspension set-ups are available on the 2013 E-class, from fixed to fully adjustable air shocks. When does the reworked Mercedes E-class go on sale? Both saloon and estate variants of the new E-class hit showrooms in spring 2013. Mega-power AMG models will also arrive in 2013, utilisiing the 5.5-litre bi-turbo V8 from the current E63 and CLS63 cars. Prices across the range will rise slightly in accordance with the extra standard kit of the new cars, so expect an entry-level Mercedes E200 to start at a smidge under £30,000.